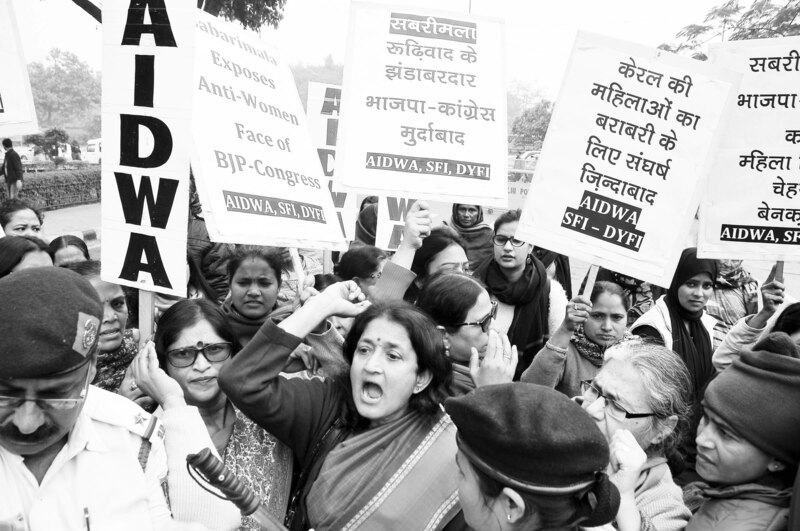 THE All India Democratic Women’s Association (AIDWA), Students’ Federation of India (SFI) and Democratic Youth Federation of India (DYFI) held a militant protest on January 4 on the road towards Parliament House against the purification rituals carried out by the priests after two women entered the Sabarimala temple. They also denounced the violence let loose by the RSS-BJP in Kerala on January 3. Women and students marched from Vithalbhai Patel House towards Parliament House, brushing aside all attempts by the police to stop them. They were finally stopped by barricades near Vijay Chowk. The protesters were arrested and taken to the Mandir Marg police station. They were detained in the police station till late afternoon. ‘We will not tolerate insults to women, Manuwadi vichaar dhaara nahi chalegi(manuvadi ideology will not be tolerated), we demand equal rights for women, auraton ka apmaan karna bandh karo(stop insulting the women), jo aurat ka maan ghataye-aisi reet hum kyu apnaye (why should we adopt a custom that demeans the women), etc., slogans rent the air. The demonstrators hailed the historic success of the women's wall in Kerala on January 1. “How dare the RSS-BJP call us impure”, exhorted a 70 year old protester, Triveni from Kabir Nagar in North Delhi. The women were extremely agitated about the RSS-BJP attempts to deprive them of the right to enter the Sabarimala temple under the garb of culture and tradition. They also condemned the attempts of the right-wing forces to create a communal frenzy and subvert the implementation of the orders of the Supreme Court in the Sabarimala case. This is a clear violation of the SC verdict. It is the duty of the Modi government to control the RSS-BJP hoodlums and protect the rights of women. Their opposition to equal rights for women in the temple entry issue exposes their treacherous plan to impose their Manuwadi ideology on people of the country. Women said that taking forward the legacy of Savitribai Phule-the legendary social reformer, who fought for the rights of women and the backward castes, the people of the country will teach a befitting lesson to the anti-women, anti-dalit Modi government in the coming days. January 3 was the birth anniversary of Savitribai Phule. The protest was led by AIDWA general secretary Mariam Dhawale, Delhi state secretary Asha Sharma, Delhi state president Maimoona Mollah, SFI leader’s Prateeksh and Dipali and DYFI Delhi state secretary Sanjeev Kumar.